A crown - sometimes called a "cap" - is a tooth-like covering placed over a carefully prepared existing tooth. Used to strengthen, restore or improve the appearance of your natural tooth, a crown is placed on an individual tooth when there is no longer sufficient tooth structure left to place a filling. 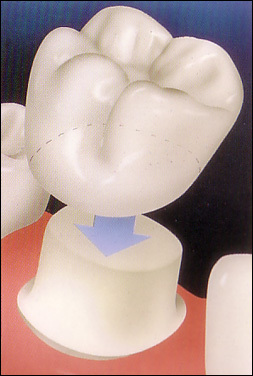 Crown is also required when a tooth has root canal treatment (Click). 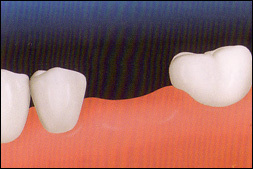 Crowns are made of all porcelain or porcelain fused to metal, which looks almost like your natural tooth. However, there might be indications for all metal crown for back teeth (gold or other precious metal alloys), such as heavy grinders, etc. 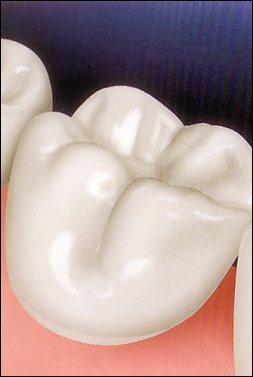 With advent of newer materials (i.e... Zirconium), the need for metal crowns has gradually diminished. A bridge is a custom device anchored to neighboring teeth that replaces one or more missing teeth. When a lost tooth is replaced with bridgework, the teeth on either side of the missing one must be prepared as crowns to serve as abutments to hold the prosthetic teeth in place. This gold standard for replacing missing teeth has be challenged in recent years when dental implants becomes preferred treatment for missing teeth. However, if implant treatment is not possible, and your adjacent teeth were previously crowned and in need of replacement, we may still make bridges for you, and we will educate you on proper maintenance for long term success. What is Involved for Getting Crowns and Bridges? After careful examination of your teeth, bone and gum condition, and both the dentist and patient agree on a crown and/or bridge treatment, it takes two visits to finish the treatment, 2 weeks apart. Your first appointment involves preparing the tooth/teeth, iTero digital impression (scanning) and temporary crowns. We don't use traditional gagging impression materials anymore (thanks to the advancement of technologies). 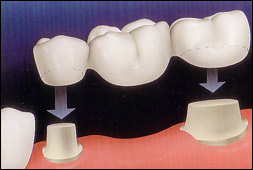 After two weeks, you return for a short appointment to cement the crown/bridge onto the prepared tooth/teeth.